<> at Millennium Stadium on November 22, 2013 in Cardiff, Wales. 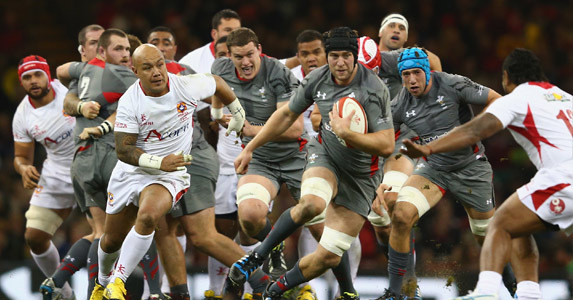 Wales beat Tonga by 17 – 7, with a score line that belies the dominance of the Welsh performance. There was much talk prior to kick off regarding Wales’ decision to wear their grey kit at home, however such was their dominance that they could have easily played in training bibs. Wales had 62% of the possession and 73% of the territory, and during the second half Wales had an incredible 80% of the territory. The impressive numbers meant that the Welsh backline was able to deliver their largest haul of clean breaks and beaten defenders in this autumn series. The Welsh scrum was stable with Rhodri Jones once again defying the doubters. The Welsh lineout functioned at a highly respectable 88.2% and Leigh Halfpenny was 100% off the kicking tee. Ryan Jones carried well, in a game perfectly suited for his heavy direct carrying. Hallam Amos impressed in his debut with a mix of lateral movement and power through the tackle, whilst Owen Williams has pressed his claims for selection against the Wallabies next week. Yes of course there were numerous handling errors, squandered line breaks, and the Tongans did create a major issue for Wales at the breakdown – Wales turned the ball over 22 times. However, we shouldn’t forget that being able to criticise a victory is a wonderful luxury. A luxury that Welsh rugby has only recently been afforded. There have been stages during the last 15 years where Wales’ first choice 15 have genuinely struggled against tier two nations. Where the result has been in doubt. This was not the case against Tonga. Wales’ massive injury problems in the centre have been far from ideal. However, without the injuries to Jamie Roberts and Jon Davies, Owen Williams realistically wouldn’t have had the chance to impress this autumn, and impress he did. Williams’ try in the 15th minute demonstrated the top end speed, over 40 metres, that some of the larger Welsh centres have on occasion lacked. This isn’t to say that Williams is small. He’s 6ft 3 and the best part of 16 stone. But he is a genuine 13 and not a 12 who has been ‘shunted out one’. He has the pace to make the outside break, an accurate pass on both hands and the defensive skills required at test level. Of course this isn’t to suggest that Williams will take the 13 shirt from Jon Davies – at least not yet. But come the 2015 Rugby World Cup, Jon Davies may have serious competition, and that’s no bad thing. Against Tonga it doesn’t really matter how many lineouts were completed, line-breaks made or defenders beaten, one stat will have pleased Warren Gatland more than any other. There were no major injuries. Wales couldn’t have faced a worse team given the current injury crisis in the backline. Despite recent quotes suggesting that they were offended by comments regarding the legality of their tackling , the Tongans hit hard. And their technique certainly comes from the Venus de Milo school of tackling where arms clearly aren’t the focus. Wales on the whole coped very well with the Tongan defence, particularly Ryan Jones whose low carrying style make him perfectly suited to carry under the heavy, upper-body tackles. Gatland has stated that he was frustrated with the Welsh performance, but the lack of injuries will have given him some solace. There are those who would like to see Wales play their first choice squad against Tonga and put on a real spectacle. However, it must be remembered that Warren Gatland is building a squad to compete at the next Rugby World Cup. And unlike many of his counterparts he doesn’t have the luxury of an ‘A-team’ with which to experiment. Barring this summer’s tour to Japan, the Welsh selectors have had few opportunities to develop their younger, second string. Whereas Stuart Lancaster et al have the opportunity to expose their next generation to international rugby in the less pressured surroundings of the Saxons camp, Gatland is forced to do it at test level. And that’s exactly what he did. 11 changes from the squad which beat the Pumas and new combinations throughout the starting 15. It was a valuable exercise. Welsh supporters have been thoroughly unimpressed by the win over Tonga. This is understandable. It was a drab affair. Wales and Welsh supporters aren’t used to wins like that. Whether caused by the excitement of a win or the anxiety of a pending loss, Welsh rugby runs on adrenaline. And as a result boring victories don’t quite cut it. As a Welsh supporter, if your heart isn’t racing at 170 beats per minute and you’re not breathing heavily into a brown paper bag when you leave the Millennium Stadium it doesn’t feel like you’ve had a day out. Despite not being the most inspired win, Wales didn’t look like losing that game for a second. We should embrace the boredom and save ourselves for the adrenaline that lies ahead next week. Whether that adrenaline will be created by panic or excitement remains to be seen.